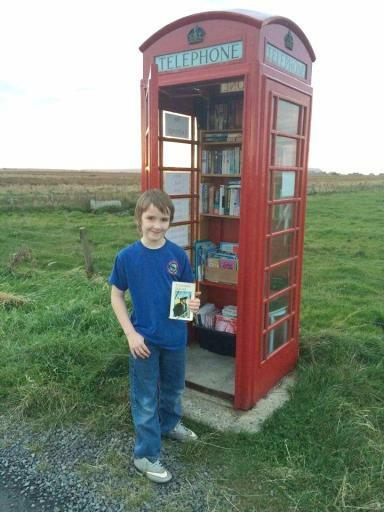 Bookworms join worldwide trend and swap big reads at small libraries in unusual spaces. 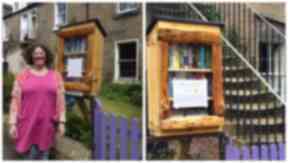 Little libraries: Scots open free book swaps using small spaces. 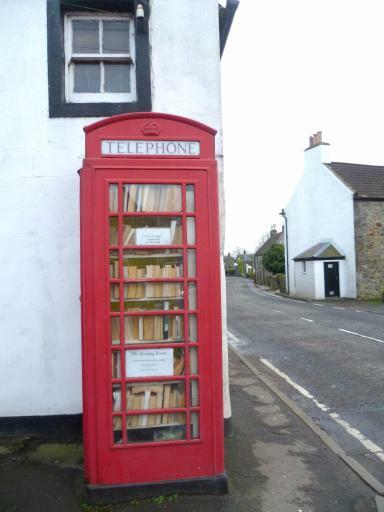 From converted red phone boxes to miniature wooden houses, a new chapter in the history of Scotland's libraries is being written. Following an America trend which started in 2010 with the launch of the first Little Free Library in Wisconsin, 36,000 free book exchanges have since been set up around the world for people to donate and share small collections of books. The founders of the movement credit Scot Andrew Carnegie's support for free public libraries among their inspirations so it is apt the trend has made its way to Scotland, where people are following suit by registering their own Little Free Library. The concept has also spread to traditional red phone boxes, which have been given a new lease of life through BT's adopt a kiosk scheme. 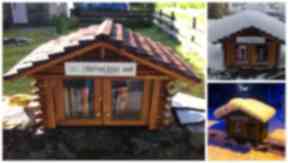 The increase of these little libraries comes at a time when the number of public libraries are declining. According to the latest figures, 32 libraries have closed across Scotland since 2010. A further 23 are proposed for closure this year, 17 of which are in Fife - a decision branded as "disgraceful" by crime author Val McDermid . A campaign, Save Scotland's School Libraries, is fighting for a national strategy for school libraries, with authors such as James Robertson and Alan Bissett supporting the cause. Have a look at some of the people taking on this quirky approach to book sharing. Swap shop: A group of pupils look after the school's outdoor library. 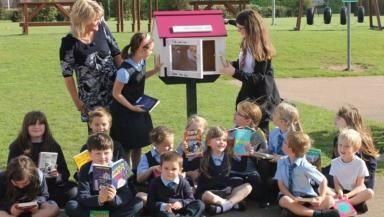 An Angus school opened a tiny outdoor library after siblings returned from a family holiday to America with their grandparents with the idea. "They brought the idea back and asked if the school would be interested," principal teacher Alison Ripley says. "We thought it would be fab. The granddad actually built it for us and put it into the school." Pupils at the Angus primary school are now tasked with keeping the library topped up, with Alison saying the summer months provide a busy spell for the little box, which carries the motto of "take one now, leave one later". Alison adds: "We just found we had lots of spare books around the school so it has been a great way to recycle some of these and get more children involved with reading." Book artist: Rachel's library is the latest addition to Scotland's growing collection. The latest little library to join the Little Free Library club can be found in Stockbridge, Edinburgh. Set up by book artist Rachel Hazell and built by the Edinburgh Tool Library, Rachel says her garden fence library is a "dream come true" for her. "The local community has totally embraced it," she says. "Borrowing books for elderly neighbours, keeping it stocked up and keeping an eye on the turnover of titles. Visitors walking by get curious and stop to have a look and take a picture. "As a book artist, sharing books with people is at the heart of my work so to have a library on the garden fence, where people can take a book or leave a book, day or night, delights me. "I love seeing neighbours and visitors looking at the shelves, discovering what new treasures have been left. Recycling books is great." 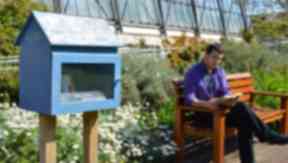 Popular: Julia says the little library concept has been embraced by both locals and tourists. Julia Wait set up the quaint Inverness-shire library after taking inspiration from a things to do newspaper supplement and enlisted the help of local craftsman Neil Armstrong to build the library structure. Since opening the very small doors in 2014, Julia says the concept has been embraced by both locals and visiting tourists. "We've had books sent to us from authors who have been in the area," she says. "I can't think of anything better than sharing a book that you've loved with someone and then finding that they love it too. "I try to keep a good stock of children's books in the library too, especially as there is no Wi-Fi in the village." Community project: Mark used the donations from the phone box library to buy his school football team's new strip. When a local red phone box went up for sale, the Thomson family decided to take on the project of repairing it. Son Mark was helping to clean up the space when he suddenly came up with the idea of setting up a little library. Taking the project under his wing, the 11-year-old has been running the Exchange since 2015 which he opens between Easter and the end of summer. His mother, Maranda, says: "We have people living locally who use it regularly. People drop off donations of books, too. "Tourists who previously only took photographs can now also choose a book and leave a comment in our visitor book." Installing a small donation box inside the exchange, Mark used half of the first year's donations to buy a new 11-a-side football strip for his school's team at Crossroads Primary. "People have been really supportive and love the novelty of it," Maranda adds. "There is something for everyone with fact, fiction and children's books. 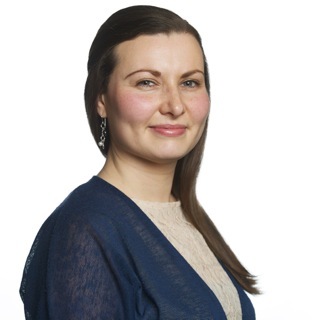 "I'm an avid reader myself - I think reading is such an enjoyable way of increasing knowledge and fostering a lifelong love of learning in children." Sunny spot: The Botanics fills its little library with nature books. On a sunny day in the capital, the Botanics is a popular spot where people can retreat with a book. Watching people enjoy the space, it seemed like an obvious choice for a Little Free Library for staff member Karlyn Finlayson, who first came up with the idea of setting one up at the Botanics, which says it ties in nicely with its research work. "Many of the books that are added also have a botanical theme and so it's an easy way for visitors to find out more about the plants that they are seeing growing around them," Lorna Mitchell, head of library, archives and publications at RBGE explains. "The RBGE Library is an important resource for our staff and students and reading up on current and historical research is an important part of the work. "It's therefore great for us to be able to encourage other people to enjoy reading, particularly about plants and gardening." Businessman David Buchan has been maintaining a converted red phone box in the village of Kinnesswood for the last six years after the box was listed for possible removal. Inspired by an idea from his wife Ishbel, David says the phone box library has become a well-used amenity in the village and an ideal photo opportunity for passers-by. "It is part of the heritage of the village," he says. "We had a lad that stopped last year on his motorbike because that's his hobby - to go around all the red phone boxes in Britain. "It is used on a daily basis. You see cars flowing down and taking pictures of it and tourists stopping to take their picture beside it. "[The photos] are probably all over the world by now." 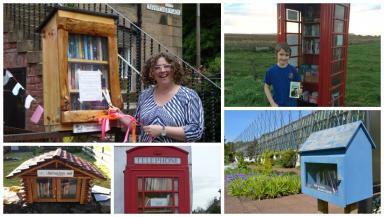 Have you spotted any other little libraries around Scotland? Get in touch to let us know.